The stereotype of most English majors becoming teachers has shifted dramatically. In the Information Age, English majors build skills used in many new careers. The explosion of the Internet as a key medium to create, organize, present, and exchange information has increased the need for English majors. Study college writing, analytic writing, technical writing, expository writing, creative writing (fiction or poetry) or focus on American, British or world literature. There is an increased need for English language teachers at all levels, in the classroom and online, in the United States and across the globe. Once you graduate from CNM, you can transfer your English degree from CNM to a four-year university. 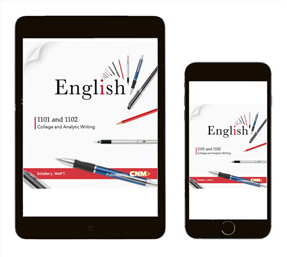 The English 1101 and 1102 OER is an open educational resource that will be free of charge to students and accessible from several types of digital devices. This textbook is a college reader for English 1101 and 1102, which is College Writing and Analytic Writing, respectively. The English 1101 and 1102 OER helps students navigate college writing and reading with sections on the writing process, genres, analytic writing, argumentative writing, research, MLA style, APA style, and grammar and mechanics. Visit https://mytext.cnm.edu/course/introduction-to-college-writing-at-cnm/ to download the e-book.